It is a familiar scenario. You are driving down the freeway. There is little traffic, so you are cruising, singing along to the radio. You feel great, but now the traffic is slowing down…where did all these cars come from? As you slow to a crawl, you look at your dashboard, and there it is. That dreaded little light, telling you that it is time to fill up the car. All of a sudden you start to panic. Will you make it to the gas station in time? What happens if you stop moving in the middle of the freeway? Can you push your car to the side of the freeway by yourself? Will someone stop to help? Will you be able to walk to the nearest gas station? Why did you wear high heels today? Does that thing from the movies, where you steal gas using a hose, actually work? O.K. so maybe it is not that familiar of a scenario, but we have all experienced that feeling of the gaslight switching on, and wondering just how far you will be able to push it before you start running on fumes. 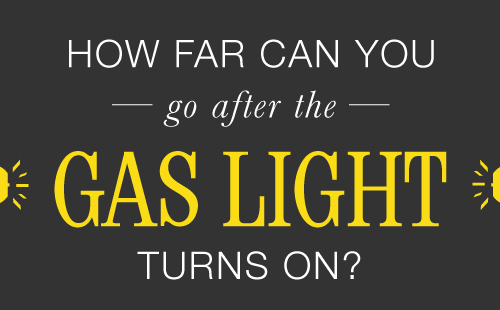 The truth is, once the gaslight switches on, you probably have more time than you realize to get to the gas station. Of course, every car is different, but most models give you at least 30 miles’ worth of warning before the tank is empty. Even a big truck like a Chevy Silverado will run for another 33 miles before it runs out of gas. But some models, such as the Toyota Corolla, will run for almost 50 miles before you have to fill up the tank. That’s enough gas to let you make that stop at the drive-through before you go to the gas station! So next time you see that ominous little light, remember to relax a little – your car isn’t going to die just yet.